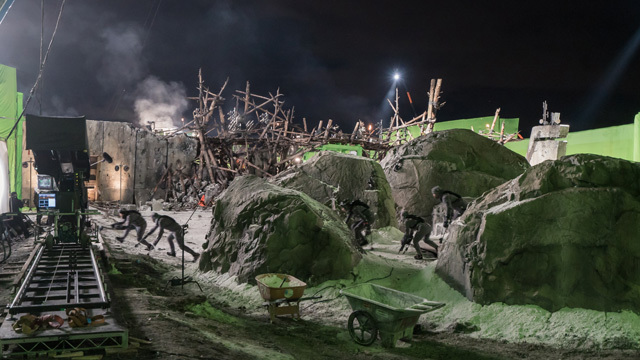 ComingSoon.net Visits the War for the Planet of the Apes Set! Nestled in the mountains of Canada (or rather, California, when you see the final film) lies a hidden military installation. Before the Simian flu killed most of humanity, it was used for storage, though what it was storing we can’t say. 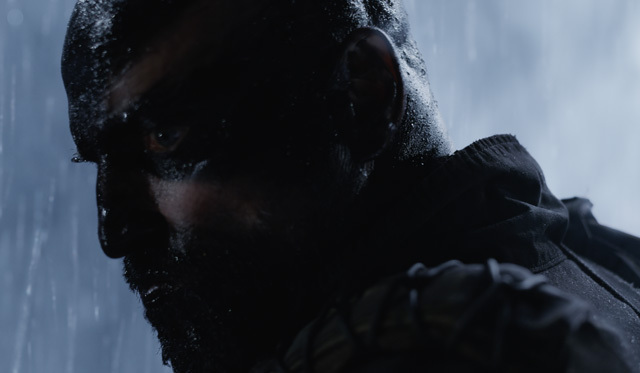 Outside the base’s main entrance you’ll see armed soldiers, true battle-tested warriors standing guard over those that live in the base’s internment camp: apes. The beasts have been captured by these humans to complete a task that only they can do. To put things in real world terms, they’re at war. 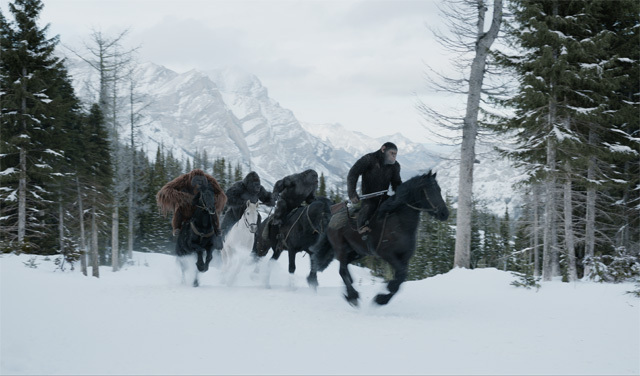 War for the Planet of the Apes picks up two years after the conclusion of Dawn of the Planet of the Apes and the conflict is beginning to take its toll on both sides, including ape leader Caesar. Played once again by Andy Serkis, Caesar will find himself facing a new type of challenge in the film, something a little more subtle than perhaps the grandiose title of the sequel would make you think. The film begins with a battle sequence that will earn the movie its title, and some concept art that we saw showed the apes even wearing helmets for their battles with the humans. How much of the Ape’s point of view? We were given a figure. If Rise of the Planet of the Apes was 50% apes and 50% humans, and Dawn of the Planet of the Apes was 65% apes and 35% humans, then War for the Planet of the Apes is 95% apes and 5% humans. That dark journey will take Caesar to some new locations and environments that he’s never ventured to before, places like the snowy mountains. The apes in the film are rendered in 2K resolution by Weta, a process that takes between 30 and 40 hours PER FRAME to complete. To top it off, 2K is a slight downgrade for the film’s resolution as director Matt Reeves chose to shoot the film on 65mm film, meaning if the apes were being rendered in 6.5K instead, an additional year of post-production would be needed simply to render the special effects. Caesar will venture to some other places in the film, like the ocean’s shore, as War for the Planet of the Apes is a road movie. Not just any road movie though, it’s a road movie on a horse back. Another piece of concept art we saw showed Caesar riding his horse and toting a gun, which conjured up one image: an old west gunslinger. Eastwood’s Unforgiven was cited to us as an influence on the film along with director David Lean, whose work includes Doctor Zhivago, Lawrence of Arabia, and The Bridge on the River Kwai. Caesar isn’t alone on this journey, as he brings along his closest friends and confidants – fellow chimp Rocket and signing Orangutan, Maurice. Rocket, on the other hand, takes this opportunity to further be there for Caesar since his friend stood by his side after the death of his son in Dawn of the Planet of the Apes. Along the way though, the group will encounter even more apes out in the world, apes that have begun evolving as well. One of those apes is played by comedian Steve Zahn, whose ape sanctuary home is an all digital set that will be created entirely in post-production. We were told little about Zahn’s character except that unlike most of the other apes, he has a firm grasp on speaking English, which he does frequently. As we walk into the giant set of the film (so giant in fact that a miniature model was in a nearby shipping container to show us what it would look like when completed with CG effects), a few things stick out. The apes are kept in cages, separated into groups, but not all of the apes are behind bars. Some of them are holding guns and standing next to the human soldiers. Some, but not too many, have defected to the other side following the fallout between Caesar and Koba. Here is where the conflict at the heart of War for the Planet of the Apes becomes small. Though the two sides are warring over an entire planet, in reality the conflict comes down to just two characters: Andy Serkis’ Caesar on the ape aide and Woody Harrelson’s The Colonial with the humans. 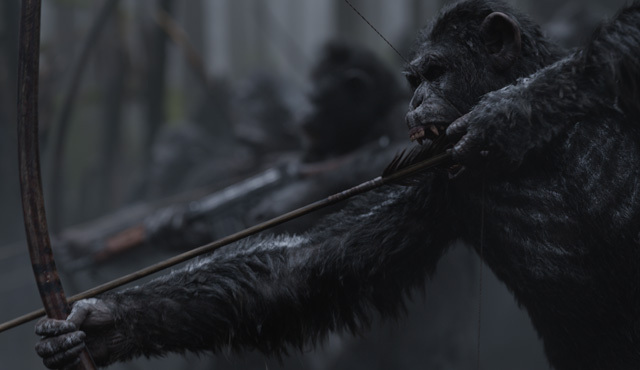 The action that prompts the opening action sequence of the film is the human’s belief that if they kill Caesar, they can end this conflict by effectively “cutting off the head” of the apes. “He’s a war time leader. He’s carrying and bearing that weight,” Serkis said. Caesar takes this human strategy to heart and decides to practice it himself, targeting Harrelson and prompting his journey. War for the Planet of the Apes will debut in theaters on July 14, 2017. You can watch the trailer by clicking here!